IRmax is a premium quality IR gas detector designed for protecting facilities against flammable gas hazards. IRmax is the perfect choice for protecting new installations or for upgrading safety on existing sites. Fast response: with a response time of only 4 seconds, IRmax provides rapid detection of hydrocarbon gas hazards. Ultimate dependability: designed and proven for compliance with IEC61508 SIL 2, IRmax has been rigorously tested in offshore environments. Wide operating temperature range: IRmax is fully temperature compensated for operation in environments from -40°C to +75°C. Dependable detection: IRmax continues to detect gas with the optical system 90% obscured by salt or other contaminants. The level of obscuration (contamination) can be checked easily via the IR Display, and a fault signal is generated when optics are 90% obscured. Proven track record: IRmax has been subjected to intense 3rd-party long-term tests for reliability in hot, cold, wet and saline environments. Low maintenance: IRmax employs sophisticated systems and algorithms to ensure reliable operation at all times. 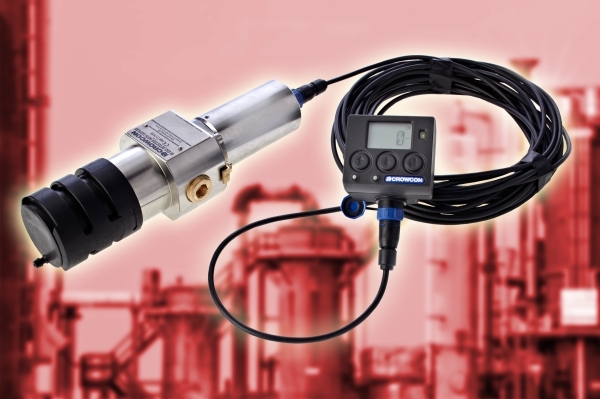 Remote non-intrusive calibration: the IR Display enables simple status checking, plus zeroing and calibration of the detector. The IR Display can be mounted up to 30 metres from the IRmax and test gas can be applied without needing to directly access the detector. Hand-held I.S. calibrator: where a local display is not required, IRmax detectors fitted with an I.S. barrier module can be checked and calibrated using an Intrinsically Safe (I.S.) calibration accessory. STAY-CLIR optics: optical components are treated with a patented coating to prevent potential obscuration in condensing atmospheres. The STAY-CLIR coating significantly reduces the buildup of dust, dirt or other contaminants on the window and mirror. Compact size: IRmax is much smaller than conventional IR gas detectors, and thus requires less space, effort and time to install. Installation options: IRmax can be wall mounted, fixed to a 2" (50mm) pipe or connected to an auxiliary junction box using a choice of mounting accessories. Versatile connectivity: with industry standard 4-20mA output signal plus options for RS-485 Modbus and HART communications, IRmax is compatible with virtually any control system. Low power: unlike conventional IR gas detectors, IRmax does not require heated windows or mirrors. IRmax consumes only 1 Watt of power, enabling smaller power supplies and battery back-up systems to be used. Remote IR Display: the remote version of the IR Display enables checking, adjustment and calibration of the IRmax detector without requiring direct access. This feature removes the need to use ladders, scaffolding and 'cherrypickers' to perform routine maintenance tasks on detectors mounted in inaccessible areas. Minimal routine maintenance: features such as automatic optical obscuration monitoring and the requirement only for occasional gas testing keep maintenance engineer costs to a minimum. Note: The above list of short codes are the most commonly ordered configurations. E07988	1.5 metre connecting lead. E07990	5 metre connecting lead. E07989	10 metre connecting lead. E07991	15 metre connecting lead. E07992	20 metre connecting lead. E07993	25 metre connecting lead. E07994	30 metre connecting lead.